Freaking out about the CSET Multiple Subjects Test? Worried that reviewing the “basics” isn’t good enough? Is this your last shot at passing the CSET Multiple Subjects test after your 4th or 5th try? You’ve come to the right place! You know, the California Subject Examinations for Teachers isn’t easy. However, here 5 CSET Multiple Subject study guide and practice test secrets that will help you pass quicker and with less effort now. Remember: you don’t need to ace the test! You simply need to pass the test. So STOP worrying. Find out which basics you need to review! You CAN pass the first time! The CSET Multiple Subjects test is actually 3 Subtests that ask both multiple-choice and constructed response questions. It’s good to know this, but this information alone will not help you pass the CSET Multiple Subjects. You must go to the official CSET Multiple Subjects nesinc website by Pearson. Then, read all the information for your exam. Subtests I, II, III Repeats info from Subject Matter Requirements Reinforces the info you must know Reading each Subtest isn’t overwhelming! Review the “Test Structure” for your CSET Multiple Subjects to skim the content areas tested. find valuable help to prepare for the CSET. dig deeper to know the standards tested in each domain. give yourself ample CSET Multiple Subjects test practice and study TIME to learn those standards. get help to review your weakest areas. Use this info for the next steps on your path to pass the CSET! Now you now know more about these standardized tests for California teacher credentialing. You’re armed with the basics that you need to prepare. The CSET Multiple Subjects “Preparation Materials” on the official website list the skills in each subtest YOU MUST KNOW! This step takes time, but it’s worth it! Complete this so you don’t waste time on what you already know! Highlight and check to Learn What You Already Know! Carefully read each subtest’s list of skills written in each Domain paragraph. Confident about a skill? Place a check above the period after that sentence. Unsure about the skill or the terms used to describe the skill? Highlight the sentence! But CAN YOU BE SURE you’ll review the right CSET Multiple Subjects study guide material? Learn your REAL weaknesses in the CSET Multiple Subjects subtests! You may think, “I already DID that!” But you may be wrong! Research shows most of us overestimate what we know. Is that true for you? Take the free CSET Multiple Subjects practice test for each Subtest I offered on the nesinc website, including the constructed response questions. Look carefully at each correct answer to your CSET Multiple Subjects practice questions. As you read the correct answers, look also at the checkmarks and highlights you completed on your “Subject Matter Requirements” printout. If you find that YOU overestimated what you knew, highlight the information you need to study. Take time to do this for Subtest II and Subtest III. Choose CSET Multiple Subjects study guides that will help you to pass based upon YOUR weaknesses. CSET study guide books and practice tests you choose should address EVERY skill you have highlighted as weak. But they should do more. Use YOUR printout of the test specifications, or BLUEPRINT guide you as you choose CSET Multiple Subjects practice exams, study guides, flashcards, or online help! How Do I find the Right Study Materials? Expect that the CSET guide is a fun read. It’s not meant to be a thriller! Supplement CSET Multiple Subjects test prep with a parenting book on education. It sounds strange, but trust me. These books are loaded with fantastic test prep information highly relevant to this exam. Try E.D. Hirsch’s What Your Fifth Grader Needs to Know: Fundamentals of a Good Fifth-Grade Education. Don’t buy the cheapest CSET Multiple Subjects study guides because you’re trying to pinch a few dollars. You’ll regret that on your CSET test dates. You’ll pay the price by delaying your teaching career and missing your first year of teaching with a $40,000+ teaching salary. Use preparation materials created by real California credential teachers who passed your specific CSET test. Beware of CSET Multiple Subjects prep classes online or offline where the presenter reads the PowerPoint slides to you. You’ll still have to home and study, but be $200 poorer and lose all that time in long winded lectures. Didn’t already spend thousands on college tuition and years of time in college? – Did that get you prepared for CSET Multiple Subjects? Likely, a preparation course will only give you same result. It’s easy to find great preparation materials—meant for YOU—once you know your CSET’s “Test Structure and Content” strengths and weaknesses! Remember that your study help will be worth it! Each Subtest costs $99 each time you take it! Work to pass the CSET Multiple Subjects the first time so you don’t have to take it multiple times! So how should YOU study for the CSET Multiple Subjects Exam? Set a daily schedule to study at least 1 MONTH ahead of your CSET. After a week of review, take a CSET Multiple Subjects practice test again. Score it. Read the explanations for both your correct and incorrect answers this time. Learn which questions and answers cause problems for YOU now. RE-focus your CSET Multiple Subjects study time on the Domains YOU need to know and the test-taking strategies that follow in #4 and #5! Mark CSET test practice questions that take YOU longer to answer. Look for patterns in the CSET practice exam questions that YOU answered incorrectly or that took your time. Practice tests are some of the most effective ways to improve test scores. A practice test is almost always a more potent learning device than spending more time studying (https://ies.ed.gov/ncee/wwc/Docs/PracticeGuide/ 20072004.pdf). The key is to make sure the practice test tests the actual material from “Test Structure and Content”. CSET practice tests not only can improve recall, but they can reduce your test anxiety. A recent Tufts University study showed that “learning by taking practice tests, a strategy known as retrieval practice, can protect memory against the negative effects of stress” (https://now.tufts.edu/news-releases/ practice-testing-protects-memory-against-stress). The key is to make sure there is more than one practice test offered! The more practice, the less stress! One full-length practice test taken between 1 and 6 days before the final test had the most impact (in the Meta-Analysis cited above). Save one test for this time period. You don’t have to be a mathematician to know it’s cheaper to take all three CSET Multiple Subjects subtest 1, subtest 2 and subtest 3 at one time. . .unless you fail one or more subtests! Choose to give yourself the best chance to pass each subtest. That may mean taking each test separately. This allows you to focus on each individual Subtest. By now, you are the expert! Choose the option that helps you pass the CSET Multiple Subjects exam the first time! The CSET Multiple Subjects test is called high-stakes for a reason: realizing your dream of becoming a California credentialed teacher rests on passing all 3 Subtests. Use the research available to make the best use of your time and energy. Use the right CSET Multiple Subjects study guides for you! Working hard now will save you money, time and frustration! "Why Not Pass The CSET Now And Tell Your Own Success Story?" It actually covers the real CSET! FREE CSET practice questions (just like the exam). 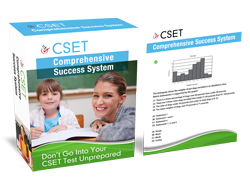 Get FREE CSET Study Guide Now!